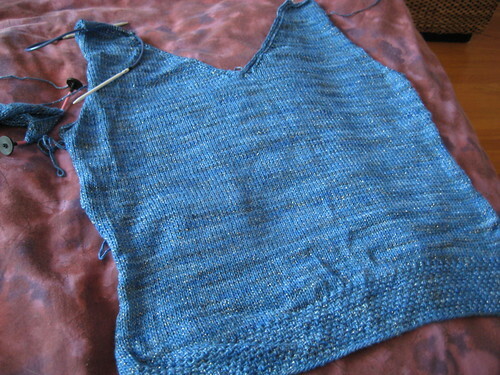 I started this top out of Blue Heron Rayon Metallic before I left for my trip, sort of hoping to be able to wear it on the boat. I was on track during my week in Austin, unfortunately, I ran out of yarn at the left armhole shaping of the front! Darn. I left the whole thing behind in Katy while we cruised. Now it’s time to make some decisions. 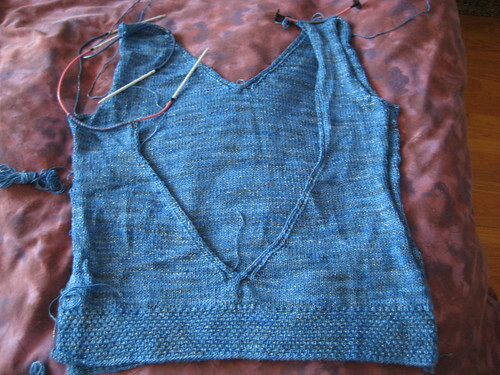 I can’t really afford another $50 skein of the yarn at the moment, so it’s time for this top to go! But if I can’t make a top that barely has a front, what the heck can I do with it? I think the answer lies in a looser gauge. I was getting about 6 stitches per inch on 3.75 mm, and the fabric was nicely cohesive and super drapey (as rayon is). Maybe a lace top instead? That would cut down on yardage. Hmmmm. In the meanwhile, I think the yarn is going to sit in the corner for awhile while I ponder more cooperative (and new and exciting) knits. 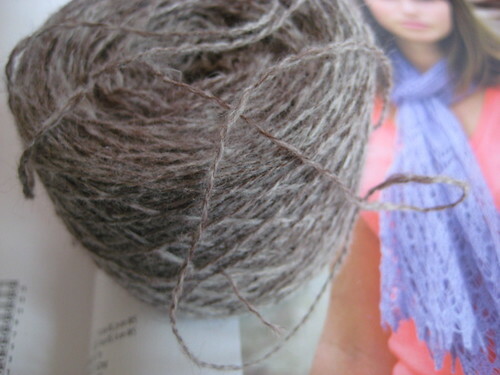 A lace scarf from Victorian Lace Today, out of my handspun polwarth/alpaca/angora. Fuzzy! Dang. That’s harsh. How about combining yarns? Use the expensive yarn for the body and less expensive coordinating yarn for trim? Or stripes. I don’t much like them as a rule, but lots of people do. Or maybe a camisole–you can end the back at the armholes and do spaghetti straps. Could you make the back V just so much lower to give you the yarn you need for the remainder of the front? Just a thought . I feel for you! Deepen the v-shaping in the back maybe. Match the back to the front with the Vs. You can wear a tank under it after all. it’s too bad you ran out of yarn because that top is gorgeous. A lot of us seem to have thought of this – doing more V or straight across in the back? The idea of lace is a good one too – there seem to be a lots of tops/tanks out there just now with a lacy bottom section and a more (or completely) solid “bra” area. 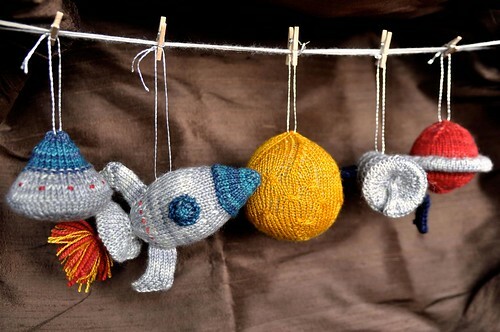 The yarn is gorgeous – good luck making it behave! Another suggestion that could even jazz it up a bit is to get a cheap, sparkly bracelet of this variety at your local Target or similar store, take off the clasps, and sew the bracelet on as the remainder of the shoulder.